Rami Owera has just defeated Soukha Kachittavong heads up in Event #16. 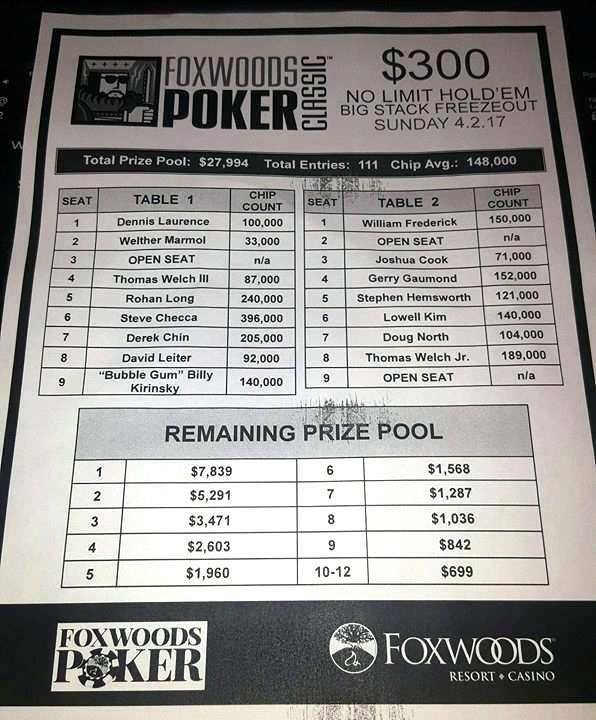 Owera takes home $76,356 and the Foxwoods Main Event trophy. Soukha Kachittavong is all in on the button holding A♦3♠, and has been called by Rami Owera holding J♥10♥. The flop comes 9♦8♦3♣, giving Owera an open-ended straight draw. The 7♣ turn brings in that straight, and Kachittavong stands up and shakes Owera's hand as the river comes the 6♥. There was around 400,000 in the middle and the board read 5♠4♠3♥K♦8♣ when Rami Owera shoved all in. Brad St. Vincent tanked for nearly three minutes before he tossed in a chip to call. "King?" St. Vincent asked Owera. Owera showed K♥6♣. St. Vincent showed Q♥5♥, and his 1,200,000 chip stack was passed over to Owera. The Q♥ turn brought the flush for Kachittavong, and the 6♣ river became inconsequential. "You could have at least given me a sweat on the turn," St. Vincent says to the dealer. "Maybe someday I will win a flip against Soukha," St. Vincent says with a smile, "And when I do, I'm sure it will be a small pot." They will now play it out for the trophy. Benny Bianco was just eliminated from play by Soukha Kachittavong. Kachittavong turned a set of queens against Bianco's flopped pair of aces, and Bianco was eliminated in 4th place. The remaining three players are now working on a chop deal. Moments ago, Jose Reyes defeated poker pro David Stefanski heads up in the $5,000 High Roller event. Reyes takes home $24,354, along with the Foxwoods trophy. Facing a raise from Jose Reyes on the button, David Stefanski shoved all in for slightly less than Reyes, and Reyes quickly called. "Come onnnnn hearts," Stefanski says, just before the flop comes 5♠2♣3♥. "Four-ball," Stefanski says, but it's the J♠ on the turn. Unfortunately for Stefanski, the 9♦. does not improve his hand, and he is eliminated in 2nd place, taking home $16,236. After many hours of three handed play, the final three players agreed to adjust the payouts slightly so that 3rd place will make their $5,000 back. Bob Borkowski was just eliminated in 3rd. He shoved all in preflop and both players called. David Stefanski and Jose Reyes both checked the Q♥9♠8♣ flop and the 8♠ turn. When the river came the 3♦ Stefanski bet, and Reyes folded. Borkowski showed 7♣7♥, but Stefanski took the pot with A♣4♥. Kenneth Rawlinson shoves all in on the button, and Brad St. Vincent reshoves for around the same stack in the small blind. Rami Owera asks for approx. counts, and Rawlinson tells him that he has around 640,000, and St. Vincent says, "Around the same, less than 700." Owera thinks for a few more seconds and then says, "I have been running good," but mucks his cards. The board runs out A♣9♥8♥10♥9♦ awarding St. Vincent the pot, and eliminating Rawlinson in 5th place. There were a total of 184 entries in today's $300 No-Limit Hold'em Big Stack event, generating a prizepool of $46,405. The top 21 places will make the money, with first place taking home $11,718. The final five players are now on their second 15 minute break of the day. They will return to play Level 24 with 12,000/24,000 blinds and a 4,000 ante. The average upon return from the break will be 1,482,000. Tou Kue just shoved all in holding A♠4♣ and Rami Owera called holding 6♥6♦. The board ran out 9♥7♠3♦4♥5♠, awarding Owera the pot with his straight, and eliminating Kue in 6th place. There are two players looking at the 7♥3♣2♣ flop. Gary Lucci checks in the big blind, and Brad St. Vincent bets 51,000 in the cutoff. Lucci quickly moves all in for around 570,000, and St. Vincent goes into the tank. St. Vincent counts out the chips to call, hangs his head down, and thinks for nearly three minutes. He lifts his head, looks at the pot, and moves the chips forward to call. The q♣ on the turn does not change the hand, but the 6♣ on the river gives St. Vincent a flush to win the hand and eliminate Lucci in 7th place. "Very nice playing with you, Sir," table mate Kenneth Rawlinson says to Lucci as he is gathering his belongings, "You made things very interesting." Solomon Yi was just eliminated after shoving all in with the nut straight holding Q♦J♠ when the board read A♠K♠10♠. Rami Owera called with top two, holding A♣K♦. Yi was safe when the turn came the 7♣, but the A♦ river gave Owera a full house to win the hand, and eliminate Yi in 8th place. There's around 350,000 in the middle, and three players looking at the K♥Q♣8♠7♠ board. Benny Bianco checks in the big blind, Gary Lucci shoves all in from under the gun, and Soukha Kachittvong shoves all in for less in middle position. Bianco folds, and the players table their hands. "Oooo, you are in good shape here," a player says to Kachittavong. The river is the 4♣, and Kachittavong doubles up. There are three players remaining, and Dave Stefanski is the chip leader on the bubble of the High Roller event. Second place will make $18,236, first will take home $27,354, and third will go home empty handed. Jose Reyes raises to 6,000 on the button. Stefanski calls in the small blind and Borkowski calls in the big blind. The flop comes K♥8♦5♥, and all three players check. The turn is the 7♣. Stefanski bets out 10,000, Borkowski folds, and Reyes calls. The river is the 5♦. Stefanski bets 16,000, and Reyes looks over at Borkowski's stack, waits for nearly a minute and then lightly tosses in the chips to call. Stefanski shows K♣Q♥ for kings up, and Reyes mucks without showing. Reyes is now left with just over ten big blinds. There were a total of 10 entries in the $5,000 No-Limit Hold'em High Roller event, generating a prizepool of $45,590. The top 2 places will make the money. The General was the first to fall early this morning, and Ryan Mostafa was just eliminated a few minutes ago. According to the dealer and the table, Mostafa got it all in holding A♦4♦ and was called by Jose Reyes holding pocket queens. The flop came Q♣10♦6♦ giving Reyes a set of queens. The A♣ turn and K♥ river meant that Mostafa was eliminated in 4th place, with two places paid. Jose Reyes, Bob Borkowski, and David Stefanski all remain. The final nine players are now on their first 15 minute break of the day. They will return to play Level 22, with 8,000/16,000 blinds and a 2,000 ante. The average stack upon return from the break will be 823,333. There is around 150,000 in the middle and the board reads K♠9♣6♣7♠. James Magner shoves all in for around 200,000, and Benny Bianco calls. Magner is in the lead holding A♣K♣ for top pair, top kicker, and the nut flush draw. Bianco will need to hit a jack as he is holding K♦J♦. Unfortunately for Magner, the J♠ comes on the river giving Bianco two pair, and eliminating Magner from play. "I'm sorry buddy," Bianco says as Magner remains in his seat, seemingly stunned. "He hit a two outer," Magner says, as he slowly stands up and prepares to exit the tournament area. There is a father and on duo in the $300 Freezeout event. Thomas, the father is in seat 4, and Thomas Jr. Welch is in seat 10. Solomon Yi just doubled Brad St. Vincent after he called his remaining 484,000 in chips after St. Vincent's shoved on the J♣5♥3♥ board. Yi held pocket queens again St. Vincent's ace-jack. The K♣ turn and 7♣ river were safe for Yi to double up. Tarun Gulati shoves all in from early position for 175,000, and Gary Lucci calls in the big blind. It's a classic race with Gulati holding 8♥8♠ against Lucci's A♦K♣. The board runs out J♣7♥2♣7♣6♠, awarding Tarun the pot with his two pair. Brad St. Vincent raises to 21,000 in early position, and Gary Lucci re-raises to 71,000 in the hijack. Solomon Yi shoves all in for 244,000 on the button, St. Vincent quickly folds, and Lucci calls. The board runs out 9♥8♣4♦K♠7♠. Yi's queens hold, and he doubles up. "Miraculously, I missed my set," St. Vincent says with a smile, "I had pocket fives." There are four players returning for Day 2 of the $5,000 High Roller event, and as of now, one additional person has chosen to buy into Day 2 directly. Anyone wishing to enter this event has until the start of play at 1pm to do so. Players start with 50,000 in chips and the blinds will resume at 1,200/2,400 with a 400. There are 13 players remaining in the Freezeout event, and 12 of them will get paid, which means they are now hand-for-hand on the money bubble. They will play until one player has been eliminated, and all remaining players will be officially in the money, and guaranteed at least $699. First place will take home $7,839. Michael Lavoie was just eliminated from play, and the final ten players are now redrawing for their new seats at the final table of ten. A full list of chip counts and seat assignments will be posted shortly. Action folds to Sam Al-Shurieki in the cutoff who shoves all in for 130,000, and Brad St. Vincent calls in the small blind. The board runs out 9♥7♥2♣6♣2♠ eliminating Al-Shurieki in 12th place. In a blind versus blind situation, Tarun Gulati is all in for around 105,000 from the big blind, and has been called by Gary Lucci in the small blind. The flop comes A♠Q♦4♠ increasing Lucci's lead when he makes a pair of aces. He maintains that lead when the turn comes the 9♣, but the 8♠ on the river gives Gulati a straight to double up. "Wow, I definitely did not see that happening," Gulati says as the pot is passed over to him. The list of Day 2 players can be found in hard copy form in the poker room prior to the start of play.